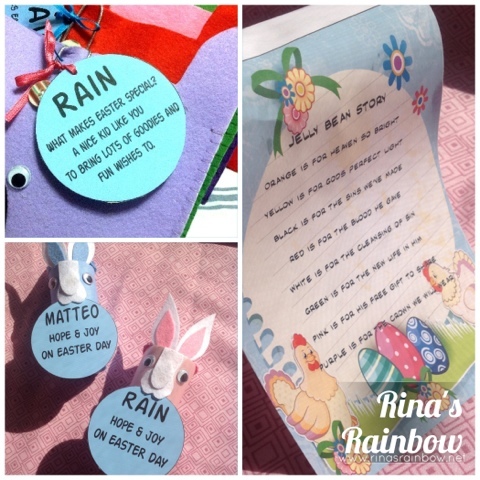 Rina's Rainbow: Rain's Awesome Easter Sunday: A DIY Easter! My mom in law has a real knack for DIYs. Even more so recently when she discovered the wonder that is Pinterest! I'm telling you, this formula below will make a simple party look extravagant, without having to spend an arm and a leg! 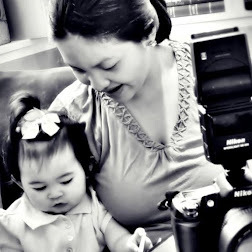 Divi + Pinterest = Bonggang party! 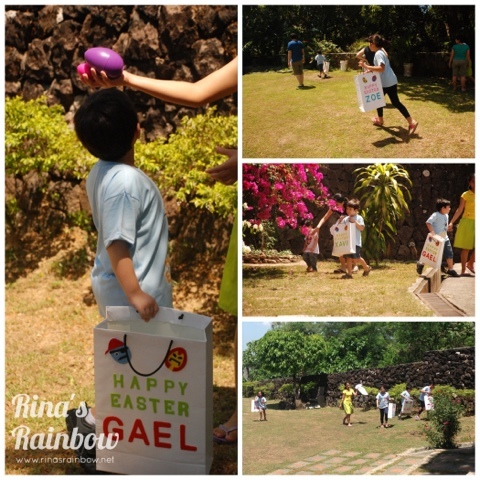 This year, mom also decided to have a Treasure Hunt game wherein the kids will follow rhyming clues and search for 5 different treasures (treats) leading up to the ultimate treasure. 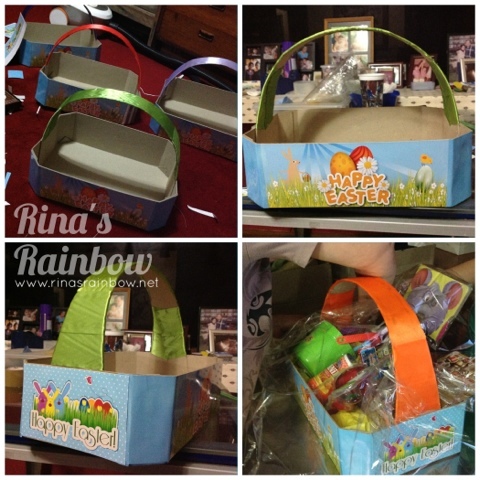 These pretty-looking Easter baskets were made from chip card boards, and then we glued printed photo paper that was designed and printed with love by my awesome bro-in-law, Ryan from his trusty computer! We just wrapped wide ribbons on the handles. Another nice touch to the treasures were some simple yet meaningful Easter Sunday messages. To remind the kids what Easter is really about. Check out the Jelly Bean Story! Finally, Easter Sunday arrived! The kids all got ready and wore a special Bug & Kelly EXCLUSIVE Easter Sunday shirt! Some Bunny Loves You! 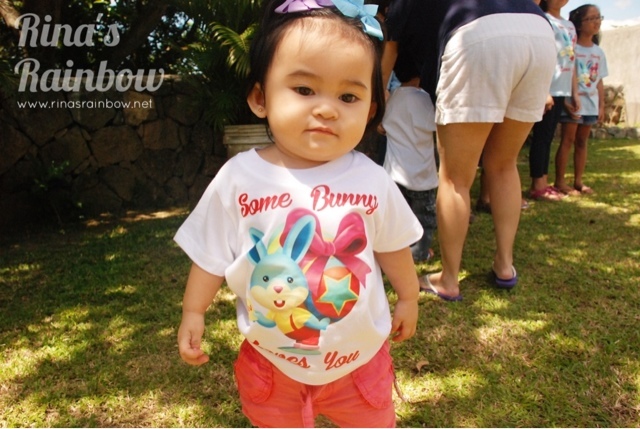 An Exclusive B&K Easter Shirt! 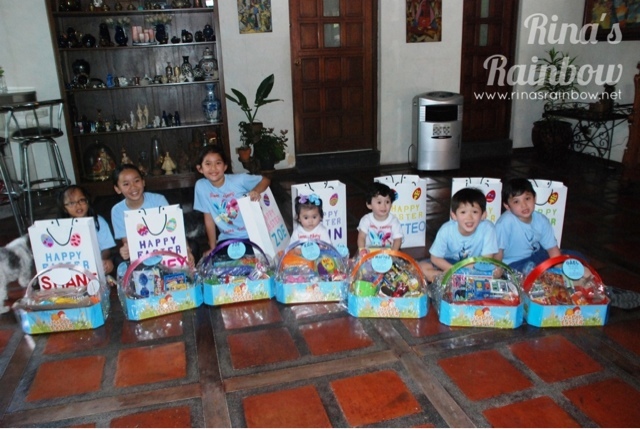 Rain and her cousins all ready for the egg hunt! 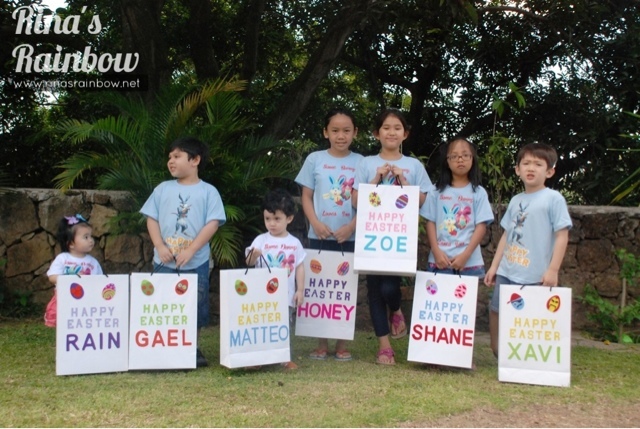 After the egg hunt, we again gathered them all to start the Treasure Hunt! My sister in law Raqs was the perfect host as she gave them rhyming clues as to where they can find the hidden treasures! Treasure hunt! Listen for the clues! 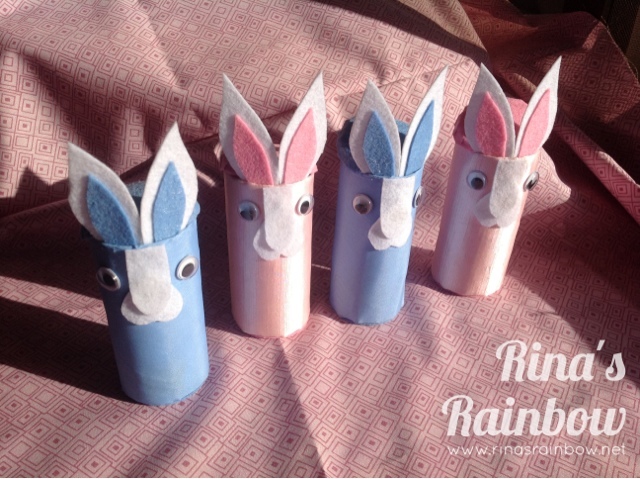 This cute bunny tube is made out of toilette paper card board core and dressed up with some fancy fabric and felt paper. Inside are yummy chocolate Kisses! 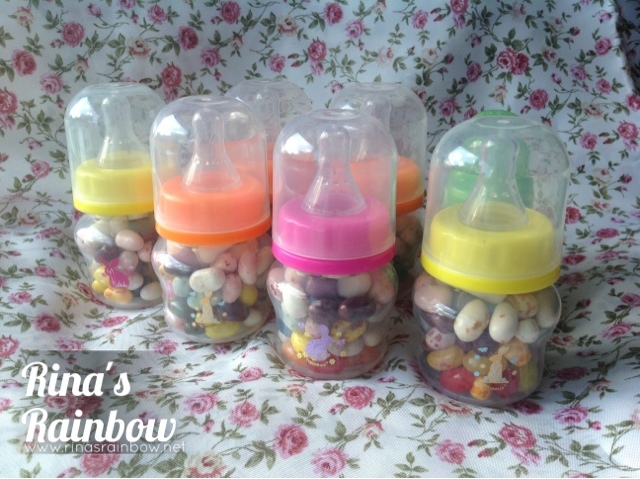 This second treasure are cheap baby bottles from Divisoria filled with yummy jelly beans! 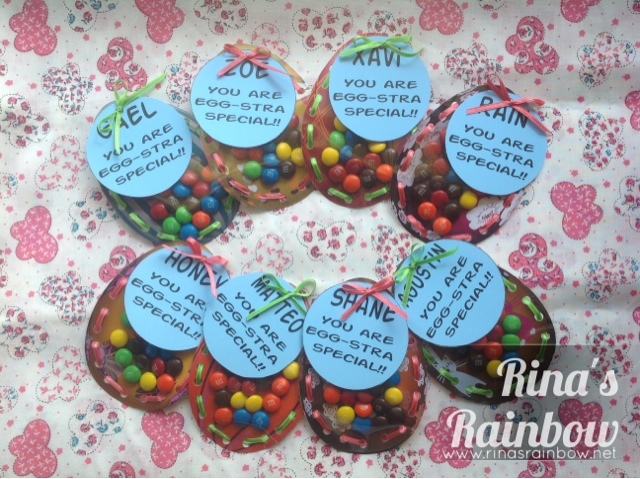 Treasure number 3 is a printed paper and an acetate, both in the shape of an egg, and then "sewn" together with a fancy ribbon after placing the chocolates inside. 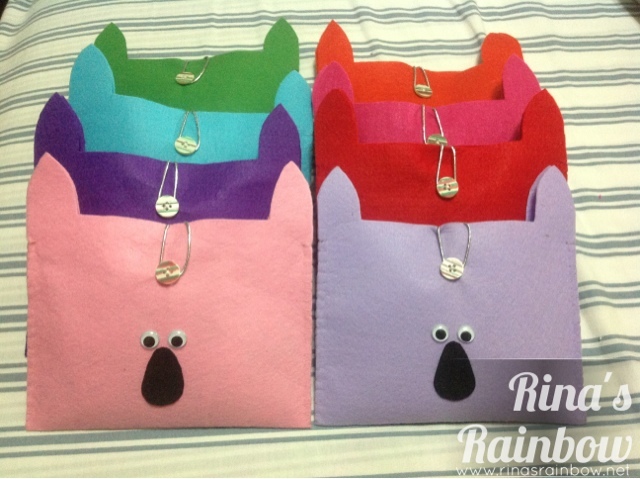 4th treasure is a bunny pouch made out of sewn colored felt paper, button, a rubber silver ribbon thingy for the lock, and some googly eyes. 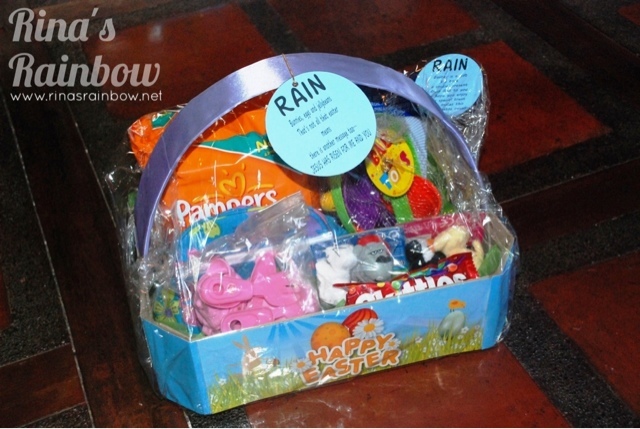 Inside are more yummy candies! 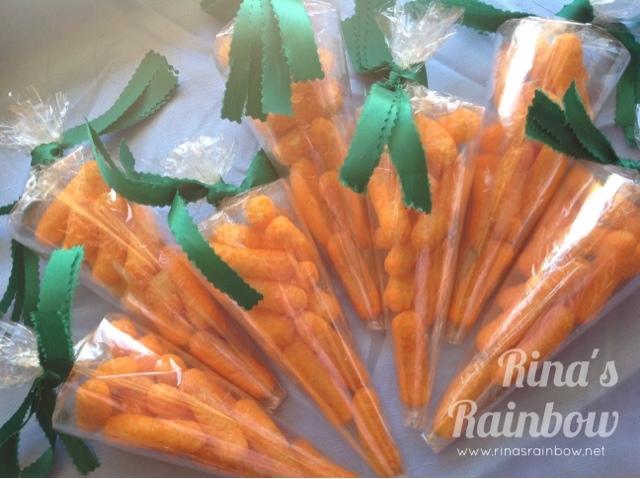 The 5th treasure are Rabbit bait, otherwise known as carrots! They're simply made our of rolled acetate to make it into a cone shape, wrapped with cellophane, then we added the cheese curls then tied them with green ribbons that I cut using some pinking shears to make it look like leaves. And finally, the ultimate treasure was hidden in mom's closet. I wish I videoed this moment to capture the "WOOOOOW"s of the kids when they saw their own treasures with their names on it! Happy Bita upon seeing the smiles on her grandchildren's faces! 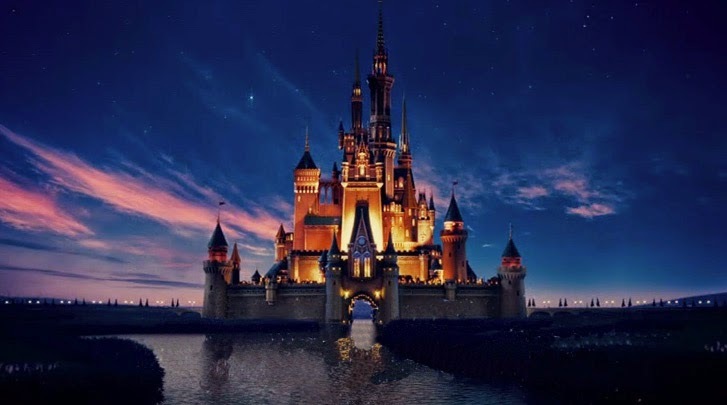 All mom's hard planning and hard work really paid off! 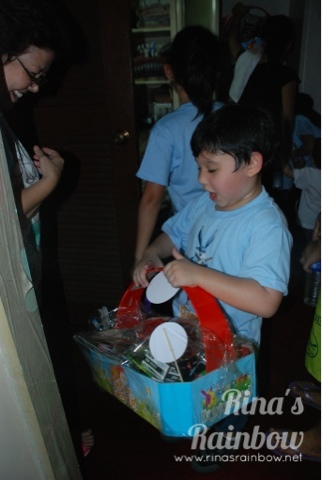 And I really had fun being a happy helper! 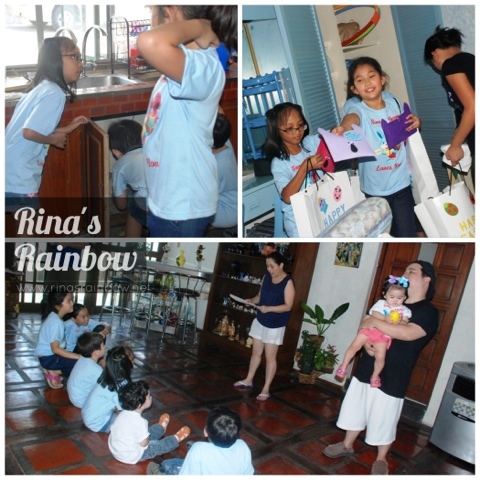 It's really fulfilling when everyone in the family joins together and lends a helping hand! 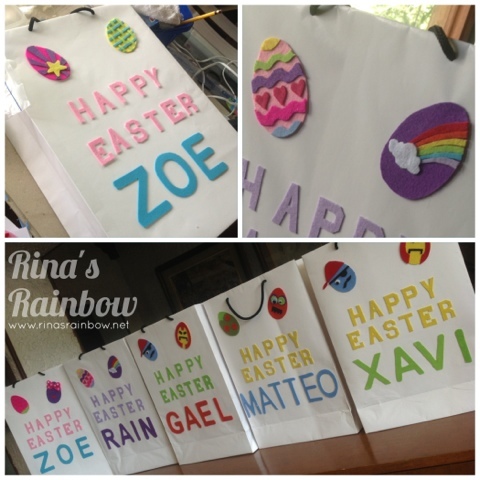 Thank you Bita for the best Easter ever!